I know; therefore I do. I wrote a piece a while back, asking the question, will your next hire for your sales team be a data scientist. It is evident that this was the wrong question to be asking. The question should be, why would you not hire a data scientist, across all your business units. While we are at it, you should hire a Chief Data Scientist. 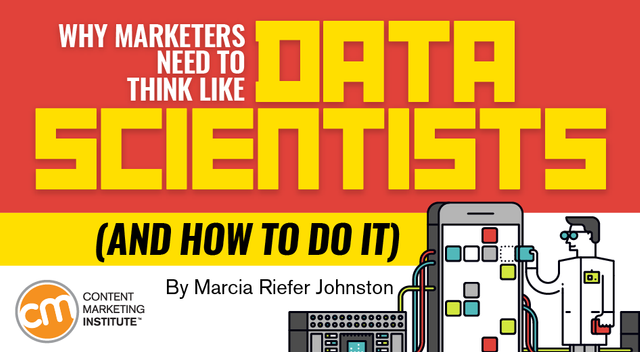 As the article quoted refers – specifically to marketers – I think in a data driven world will no longer cut it. More and more internal business decisions will driven based on data. Data for the most part, an organisation has had in some shape or form, just never readily accessible. Irony is, that all that data that has been sitting in spreadsheets, is now useful because that is how the machines like to ingest it at the back end, to give you the insights that you are looking for. This is not unique to Marketing or Sales, they are just the last business unit to start to be talked about in this way. My Wife is COO at Law firm and has been looking at this for the last 18months or so with them. I have seen some of the tools that law firms now use in their day to day running of the business – it is based on data that has always been there, typically around how legal matters are delivered. This is now being visualised and reported in an entirely different way, enabling different questions to be asked of the data and therefore giving more insight; thereby driving better and more informed business decisions. This also is giving an improved client experience around how legal services are being delivered. This is the direction sales & marketing has to also go. They have to work better together as business units to help each other in their overall understanding of this client buying journey – which doesn’t stop when the deal is done I hasten to add – they continue to but, or not as the case may be. Referring to the I know, not think statement. Basic marketing automation tools will give you this insight – I know they X organisation has visited this page on our website, or I know X person has read this white paper or blog post. This data has always been available yet, does Sales even know they can ask for this? Does Marketing offer this up and ask Sales for feedback as to what this means in the buyer journey and what should happen next? Then layer on the data that tools such as Linkedin at a basic level and Sales Navigator at the other end of the scale offers up on a daily basis. I know you have changed job, I now you commented, liked or shared that. I know you wrote that. I know you are connected to X, Y & Z – can you make an introduction. And this is just the basic stuff. As we move into the next iteration of data analytics layered with the AI & ML, all these tools will need feeding – if your data is poor at the outset, then the best AI in the world will still be dumb. This is where you will need to support of Data Scientists who truly understand data and what good needs to look like to get the best out of the technology you will no doubt be spending your budgets on, only for 6 – 12 months’ time, the tool gets the blame for not delivering on what was promised. I think; therefore, I am. Or is it now, I know; therefore I do.